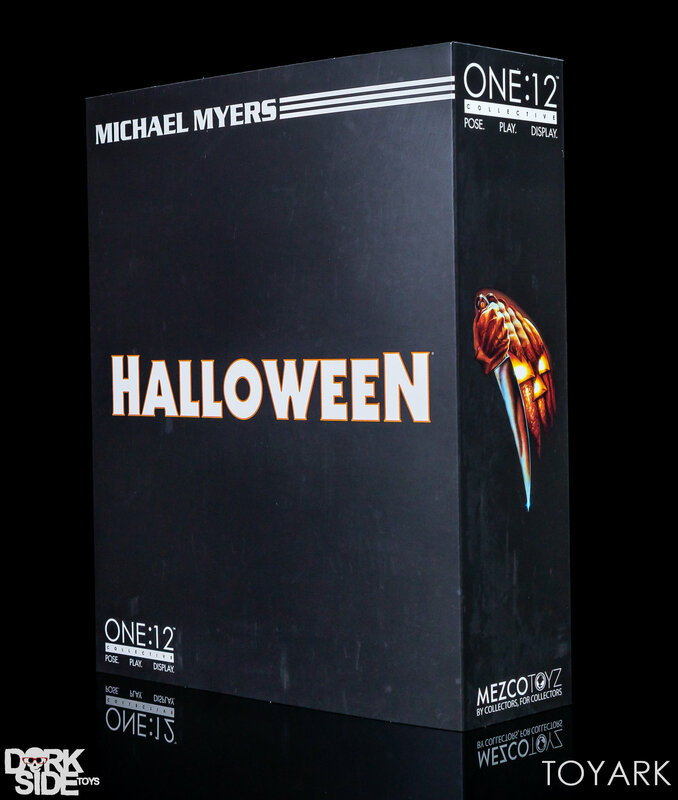 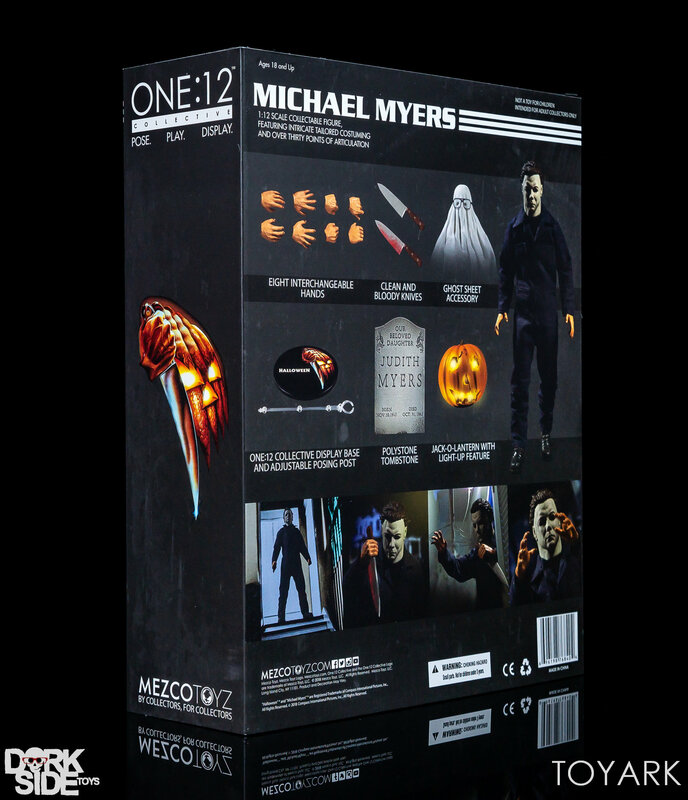 The Michael Myers figure is packed in Mezco’s standard One:12 Collective packaging. 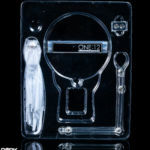 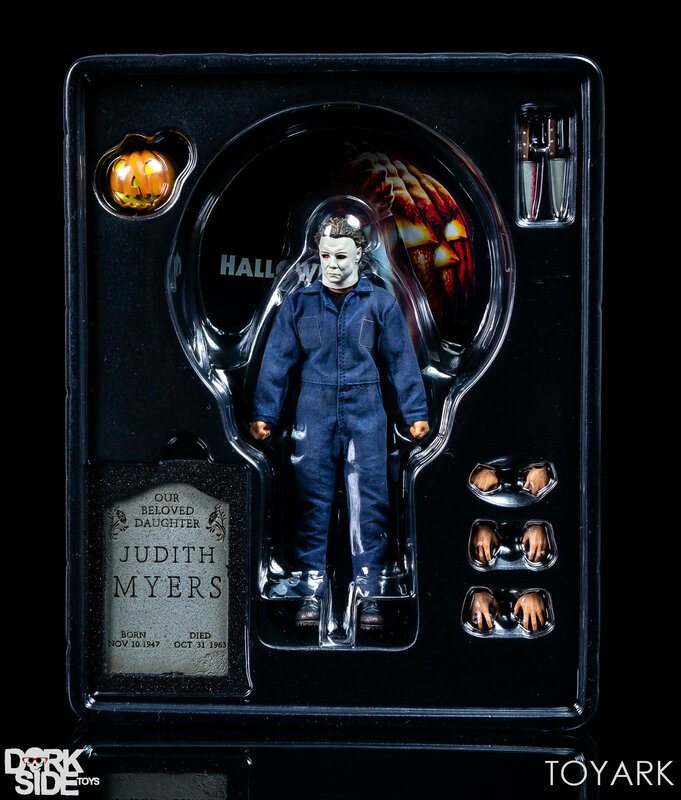 The box features a cardboard slip cover that, when removed, showcases a large window to view the figure and accessories inside. 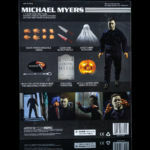 The back of the slipcover details everything that is included with the release. 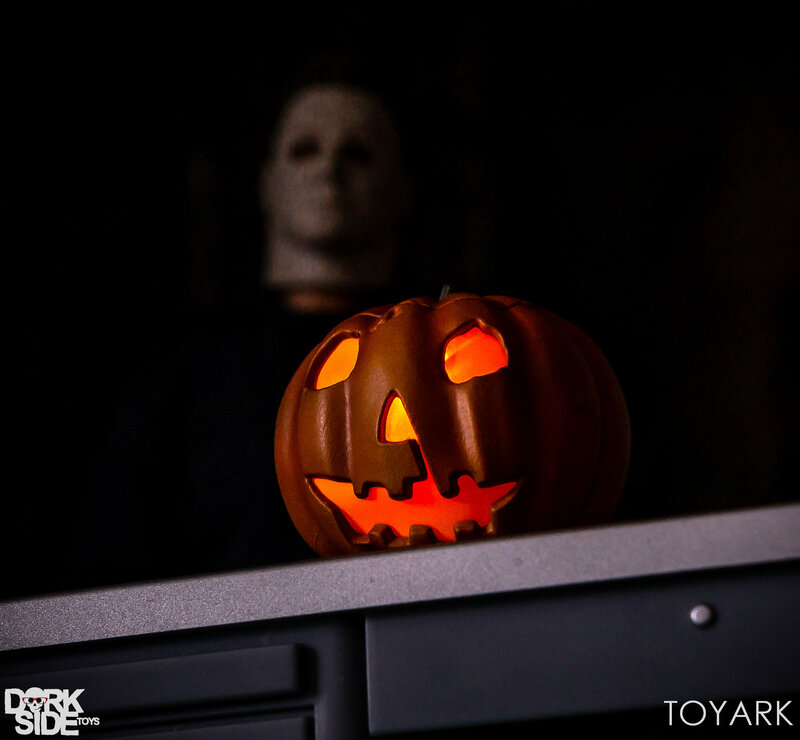 Michael Myers sits on a plastic tray with no twist ties used. 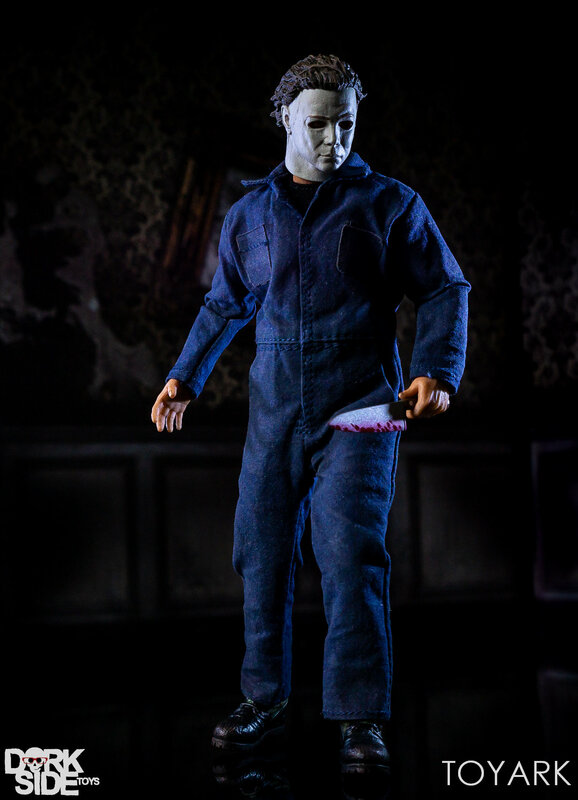 The figure can be placed back in for easy storage as needed. 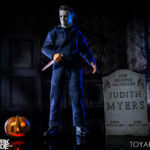 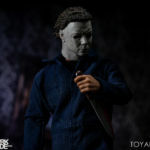 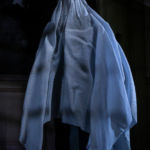 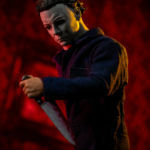 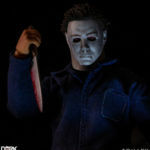 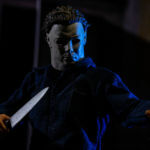 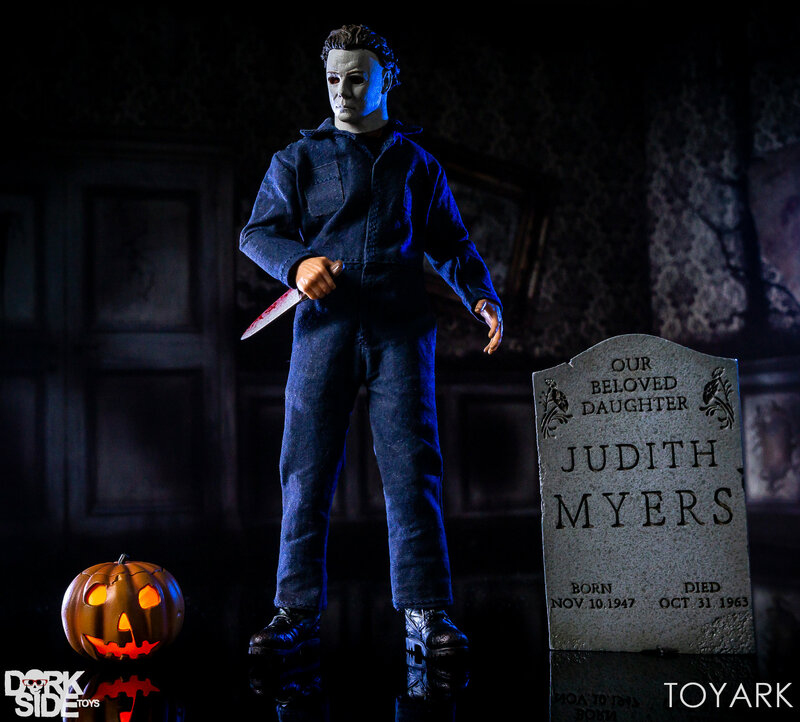 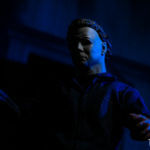 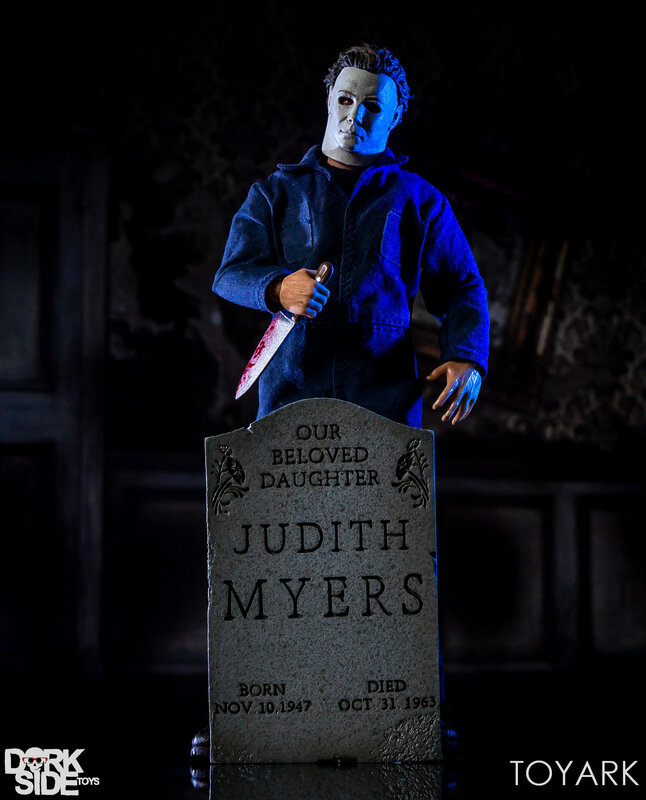 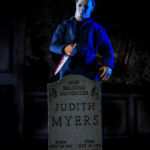 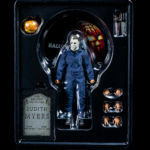 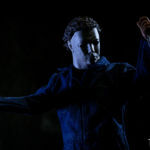 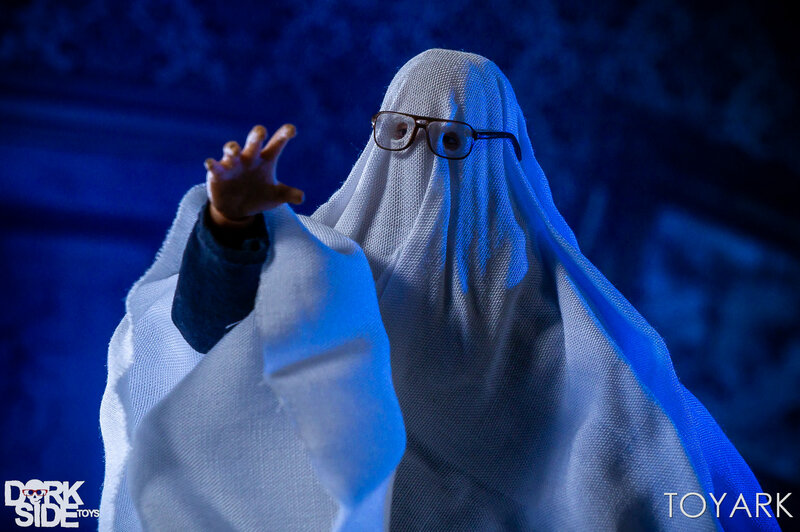 The figure includes multiple interchangeable hands, a knife, a bloody knife, a Judith Myers tombstone, a light up Pumpkin (with batteries included), a “Bob” Ghost sheet, and a figure stand. 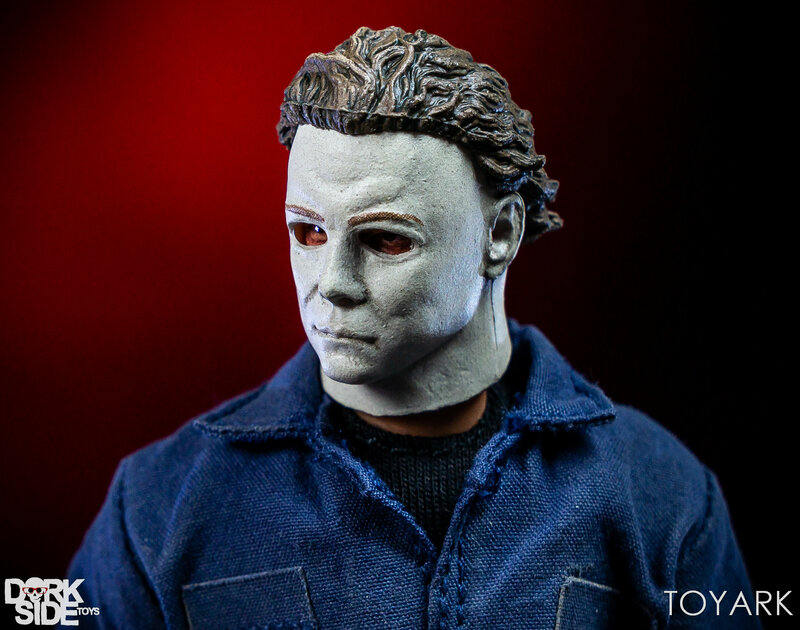 Right out of the box, the first thing most fans are going to gravitate to is the head sculpt. 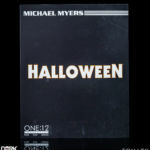 As Michael Myers wears a classic rubber Halloween mask, it’s important for any company to have that look correct. 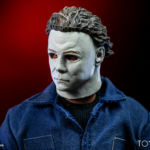 Not only does it have to look like a mask, it has to look like a 1970’s William Shatner mask, something that not all companies have been able to achieve. 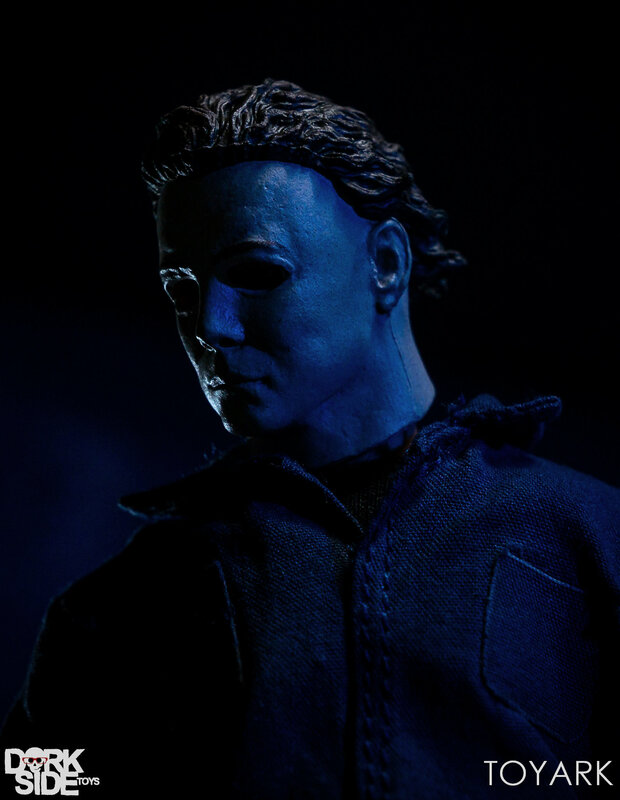 Thankfully, Mezco knocked it out of the park in my opinion. 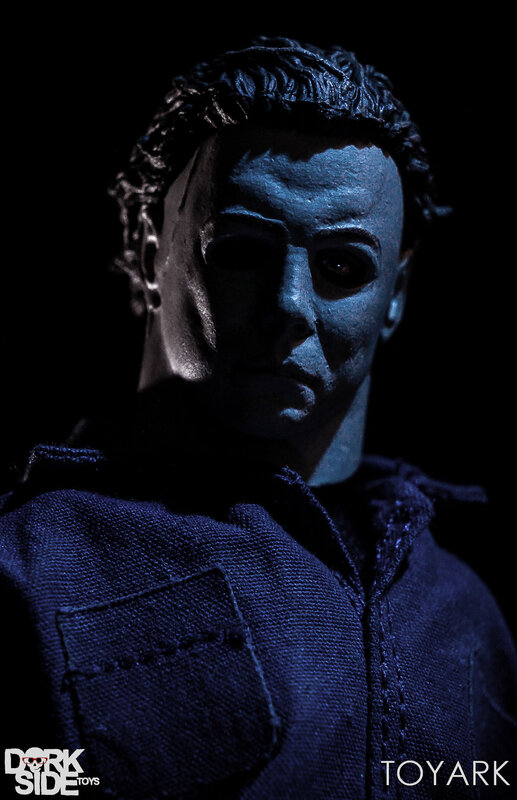 The portrait is the highlight of the figure, and in film style lighting looks spot on to what I expected.The eyes are perfectly sunken in and easy to hide in shadows. 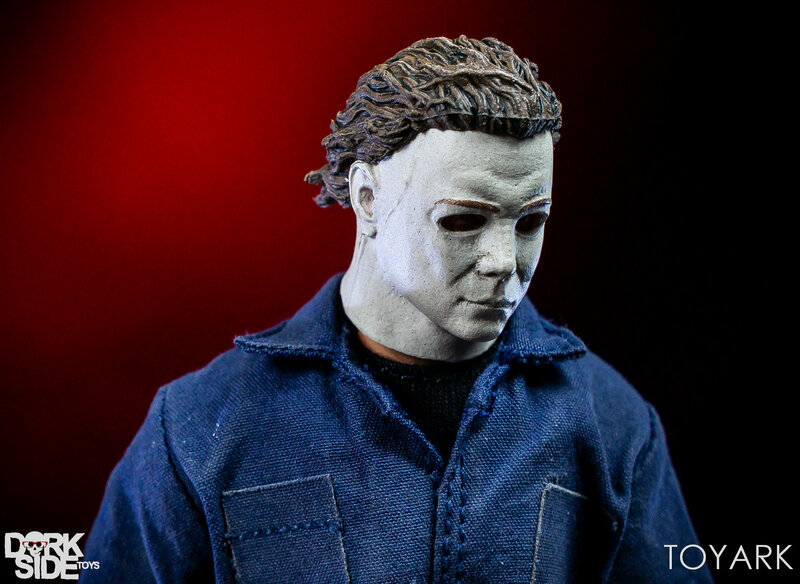 The paint work on the head is excellent as well, with very subtle washes throughout, and nice transitional colors in the sculpted hair of the mask. 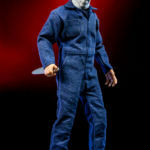 Another nice paint touch can be seen in the hands of the figure, which have a very dirty look to them. 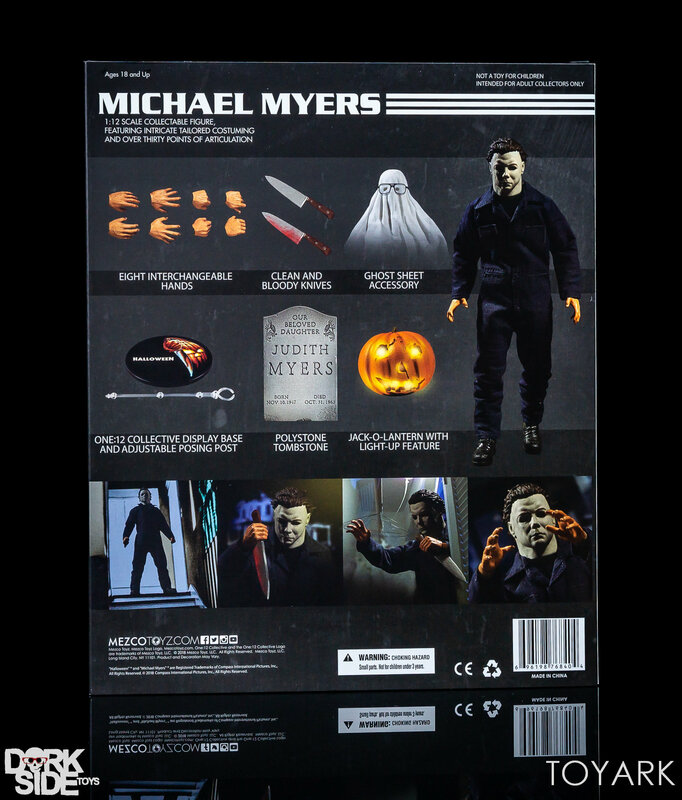 Michael Myers includes a nice assortment of film themed accessories. 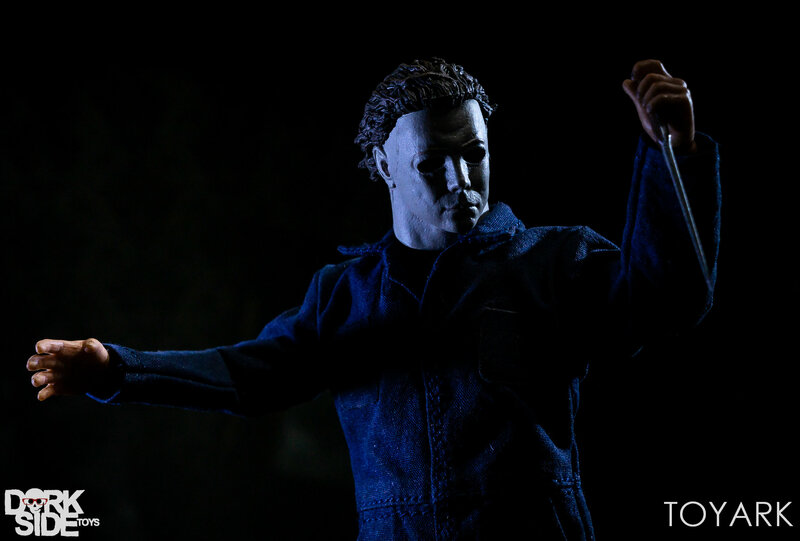 The numerous hands swap out very easily, and the small wrist joint never feels like it’s going to snap when changing out the hands. 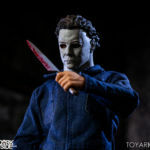 The gripping hands both hold the two knives without issue, and the various poses of the hands make them worthwhile inclusions. 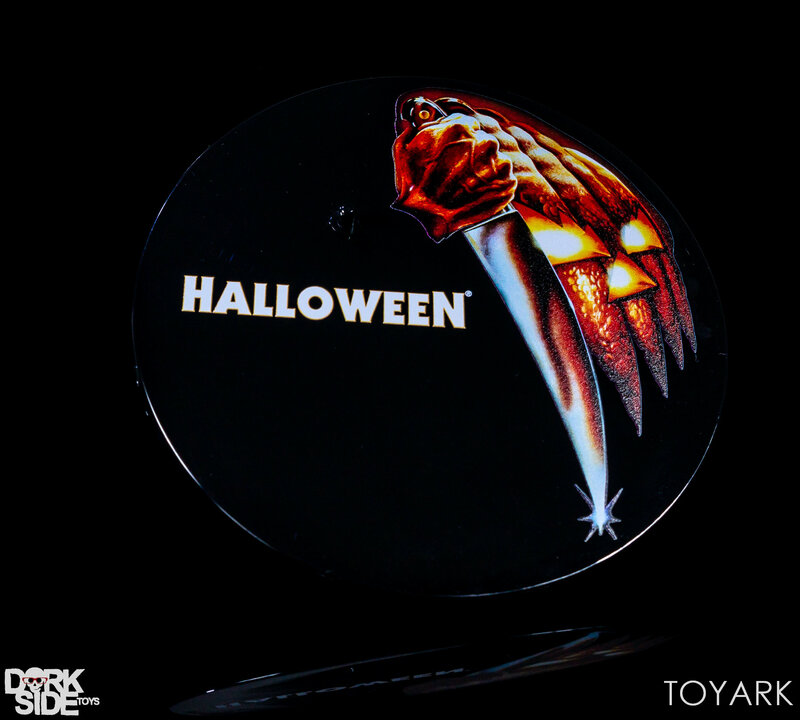 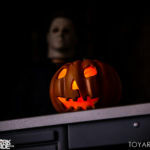 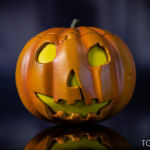 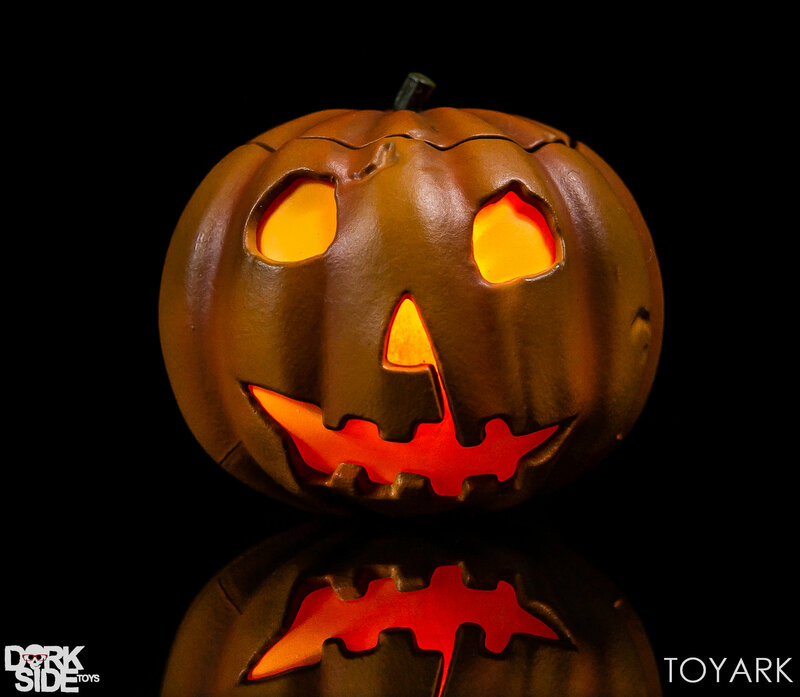 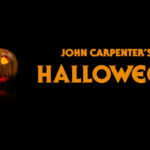 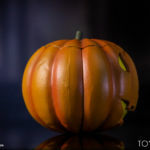 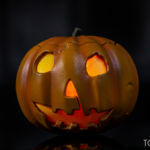 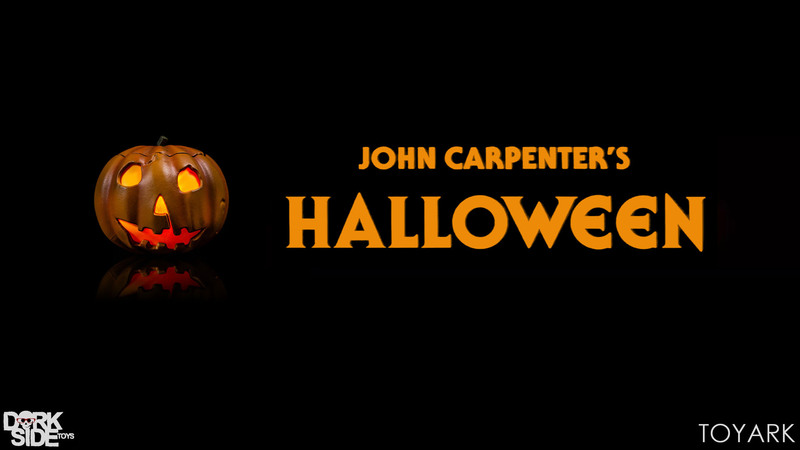 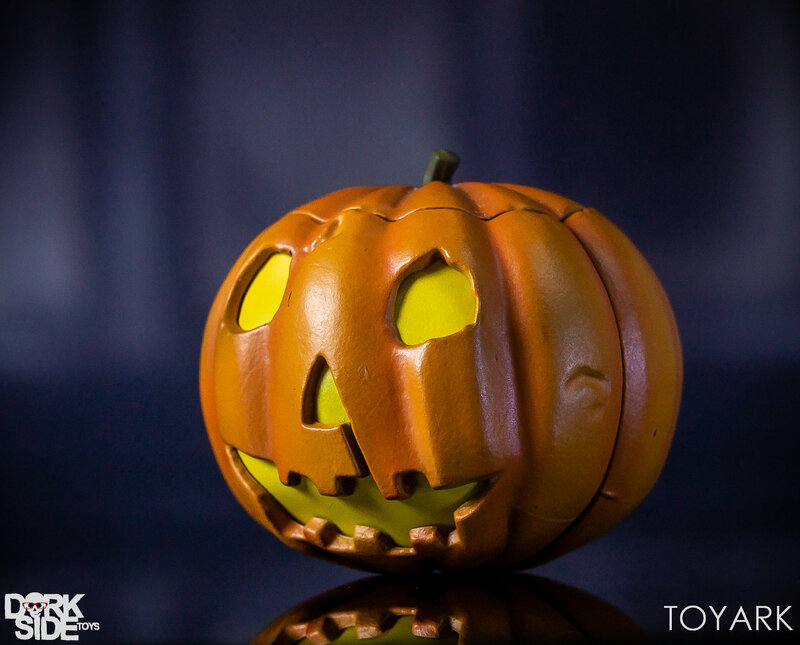 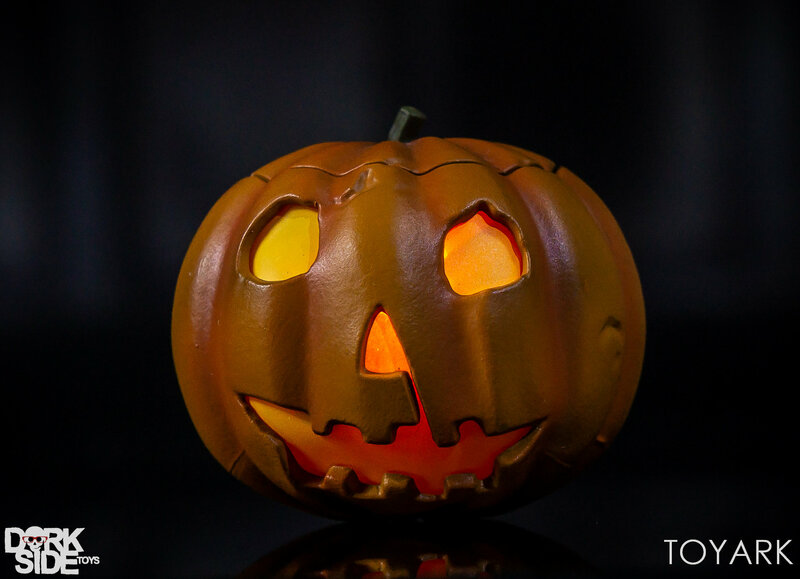 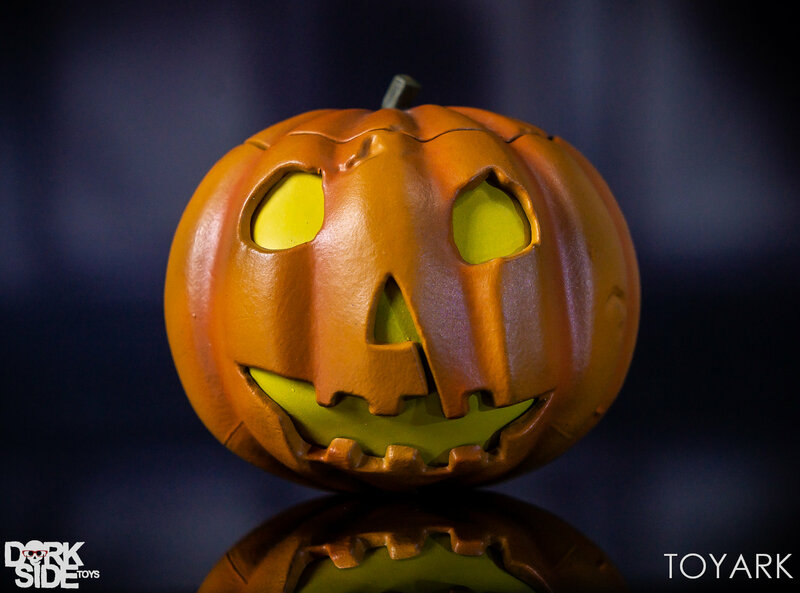 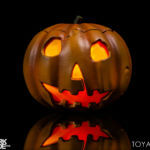 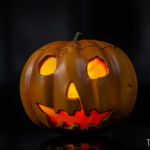 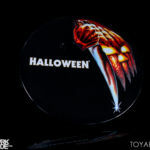 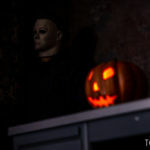 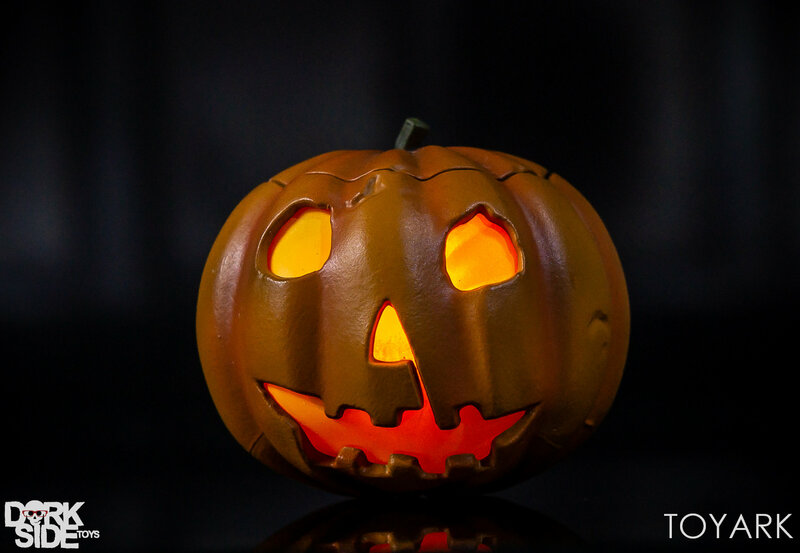 The included Pumpkin features a flickering LED light that mimics the opening titles of the movie. 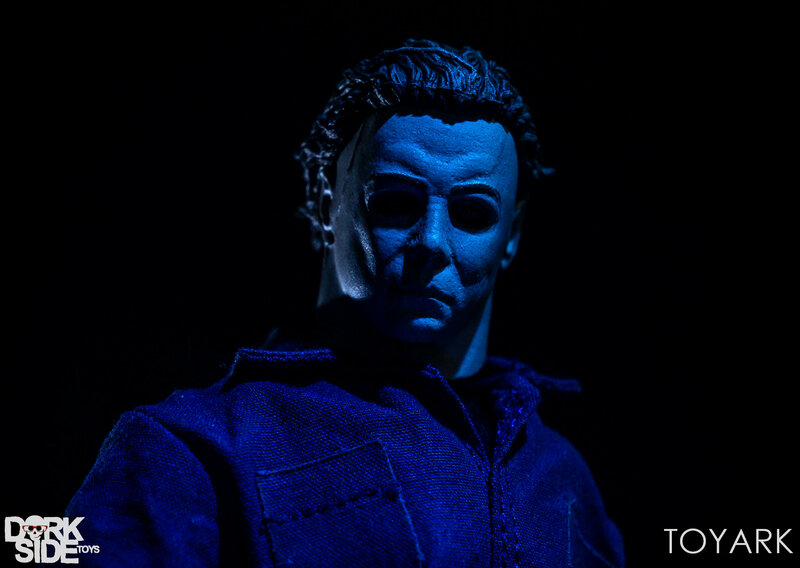 The light is fairly bright and looks great. 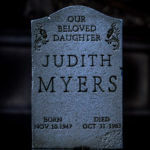 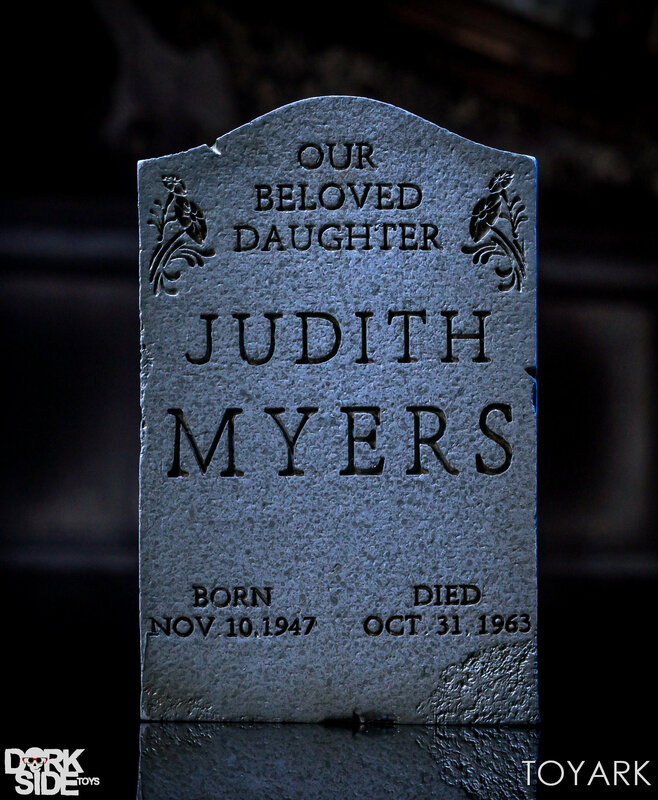 The Judith Myers tombstone is surprisingly sold and fairly heavy for its size. 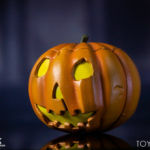 The sculpt work there is impressive, with a nice heavy stone texture and sharp engravings. 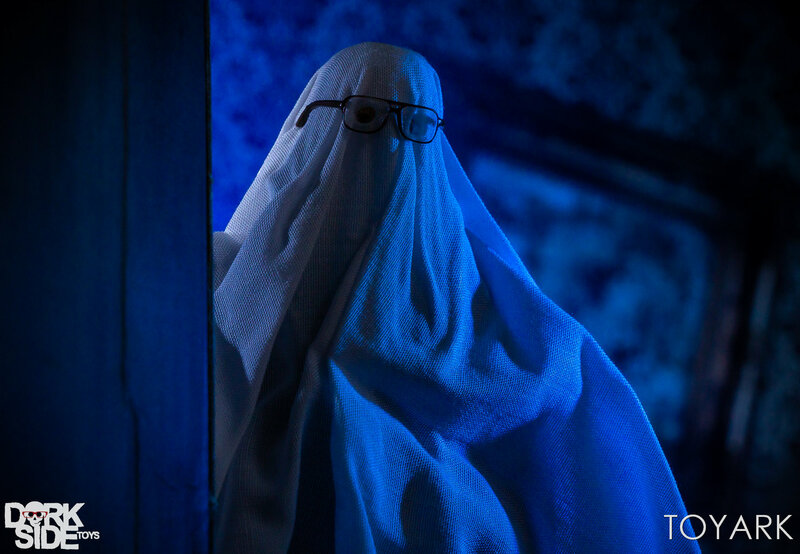 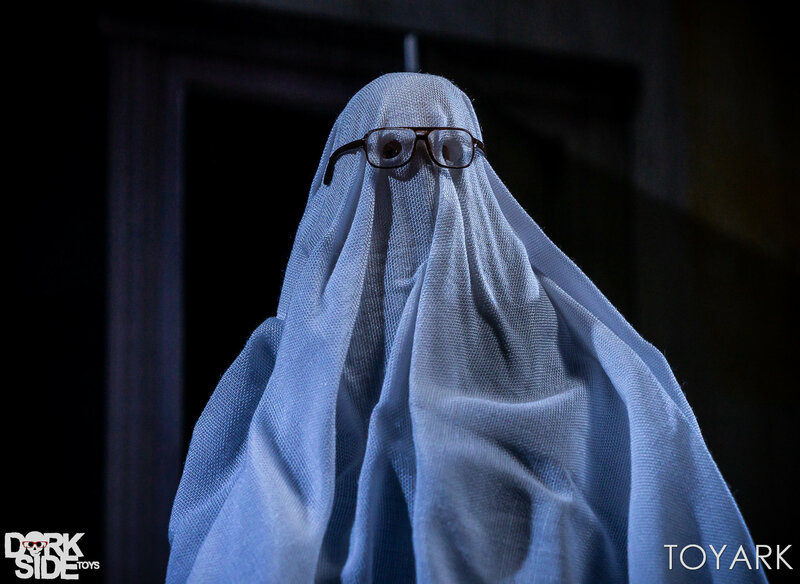 The accessory that really jumped out at me was the “Bob” Ghost sheet included here. 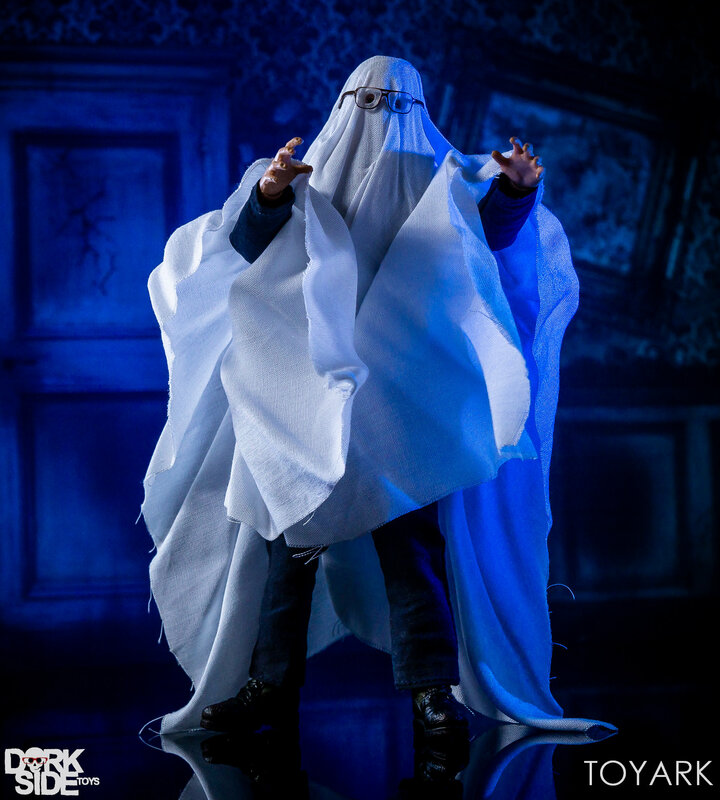 Instead of being just a piece of fabric you throw over the figure, it actually has real thought put into it. 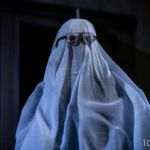 For this, you remove the portrait and attach the sheet to the neck joint, as there is a socket and sculpted shape at the head of the sheet, and the glasses are affixed to that. 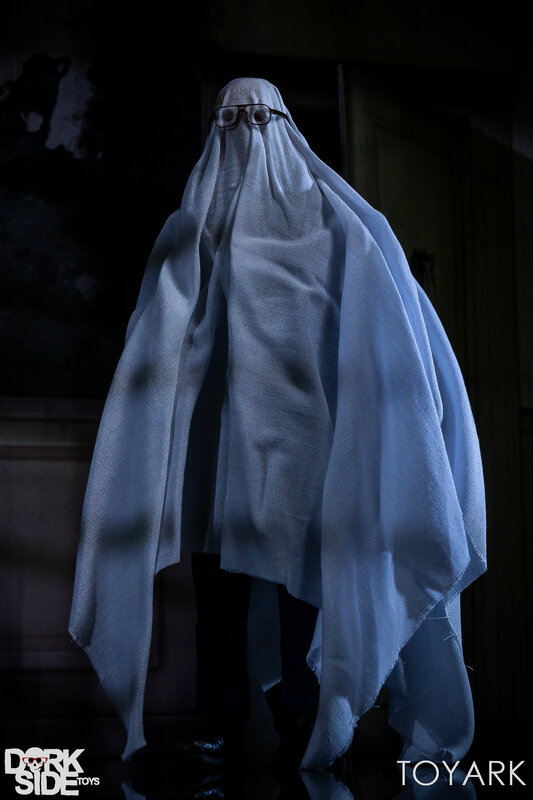 It works great, and will keep the sheet perfectly in place if you choose to display him like that. 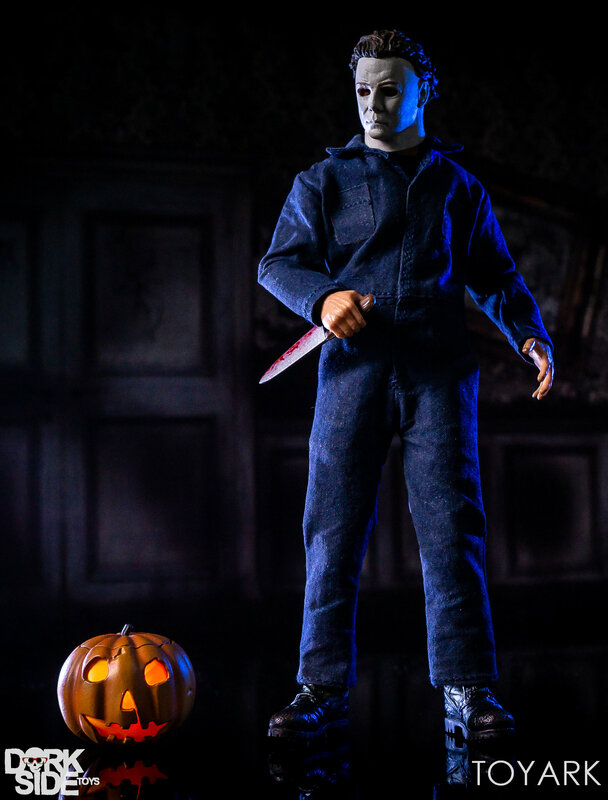 As someone more used to 7″ to 8″ scale horror figures, I still found myself impressed with the smaller Michael Myers. 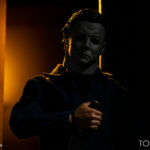 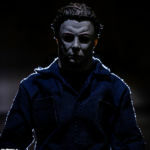 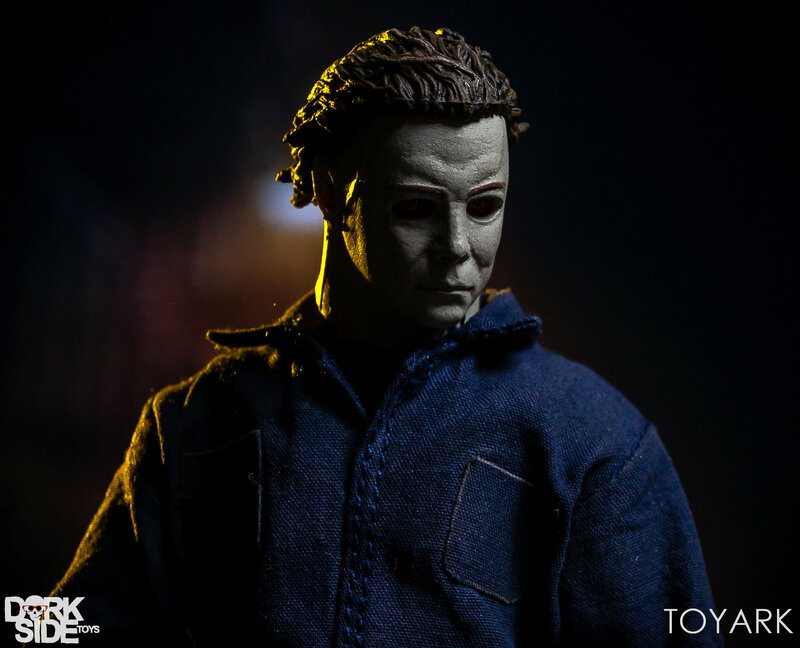 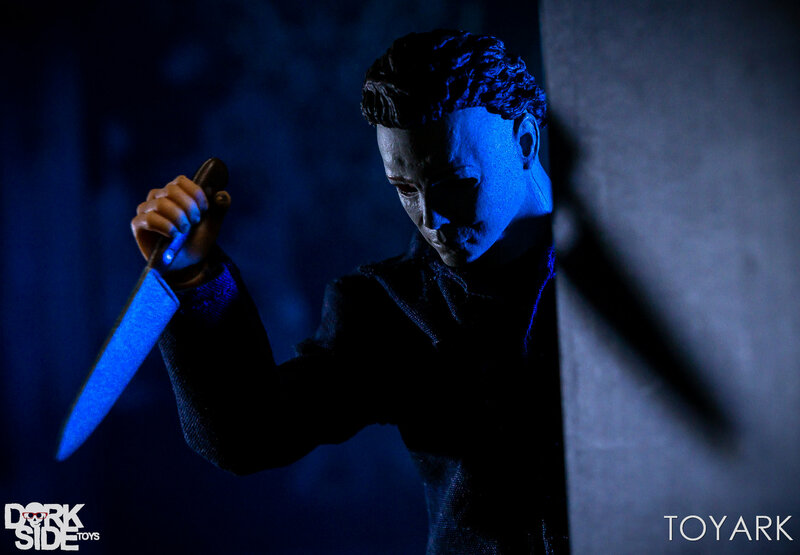 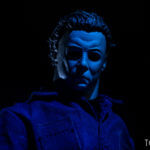 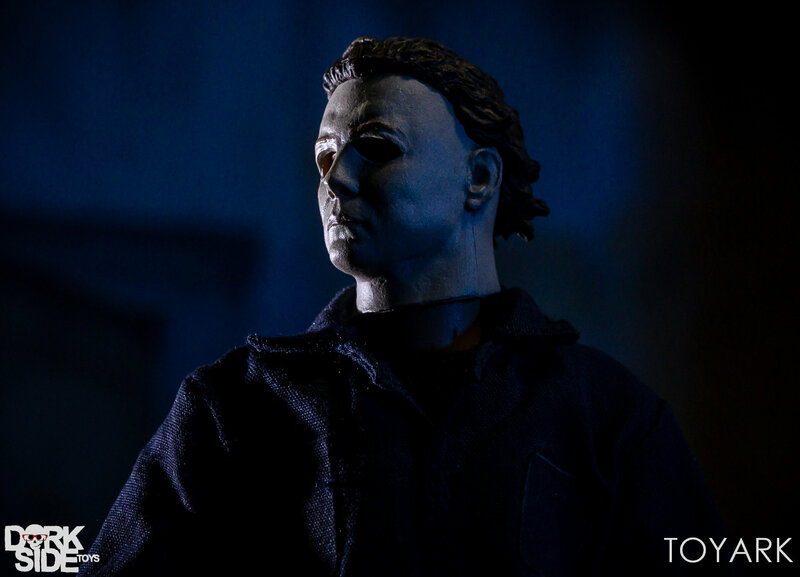 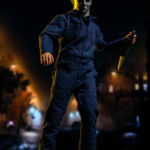 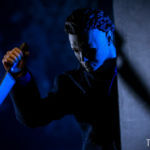 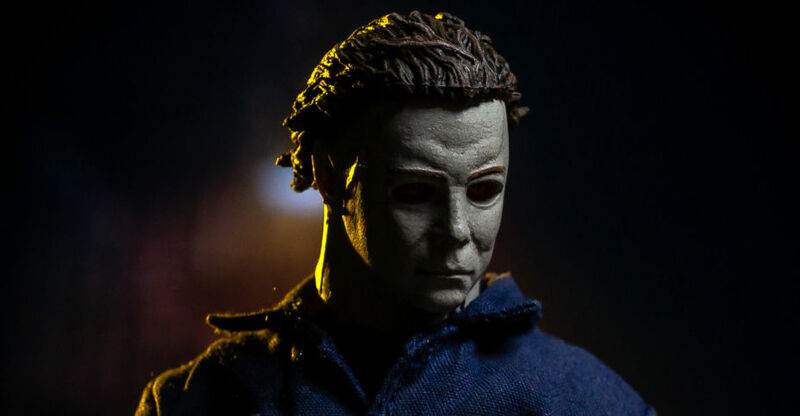 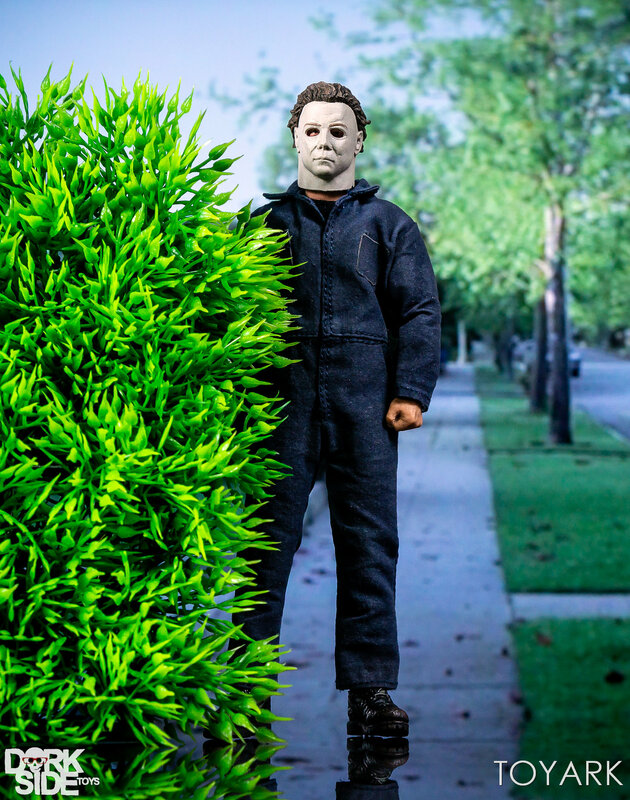 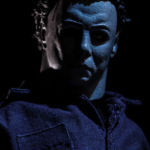 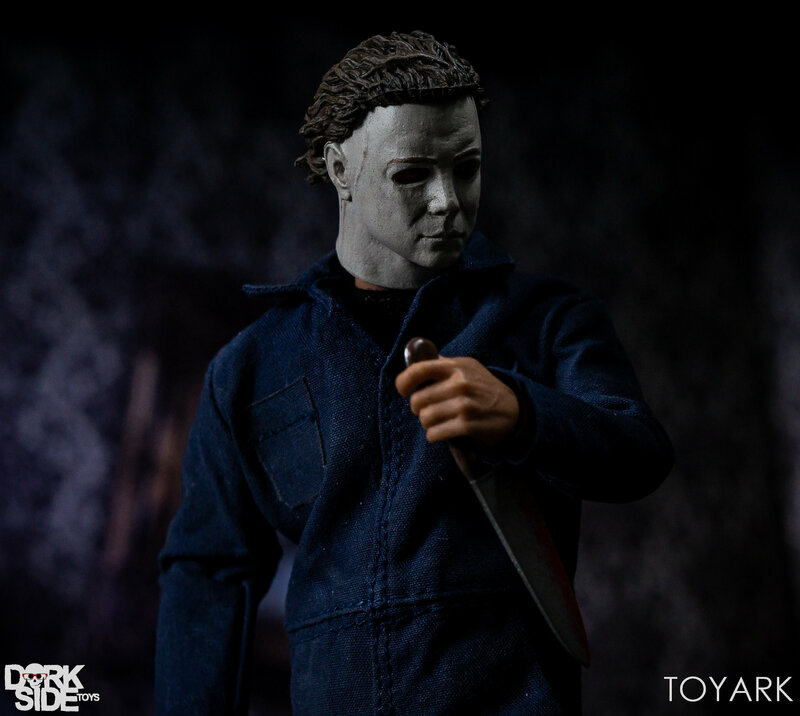 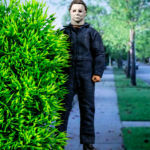 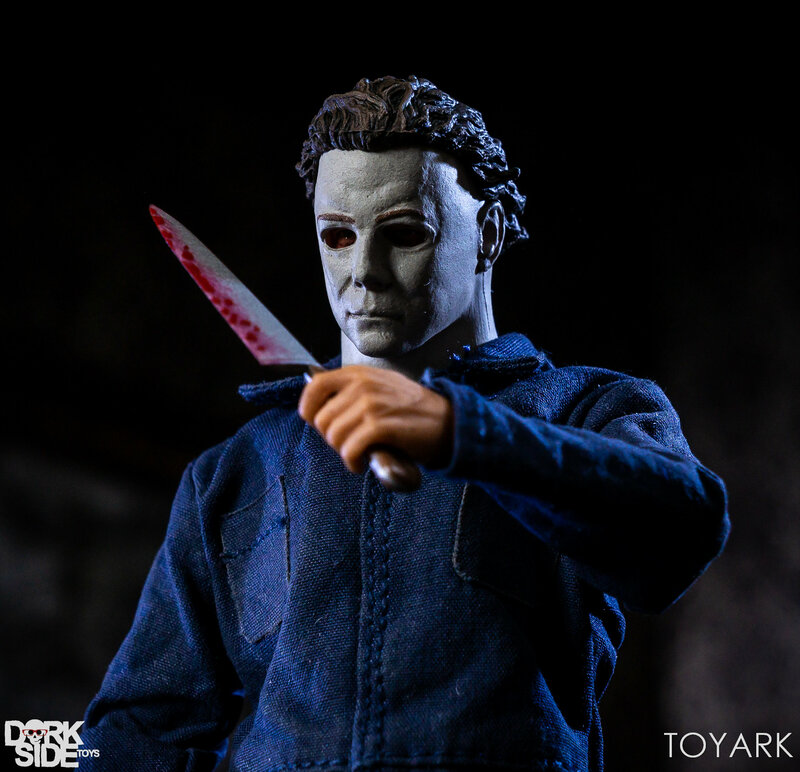 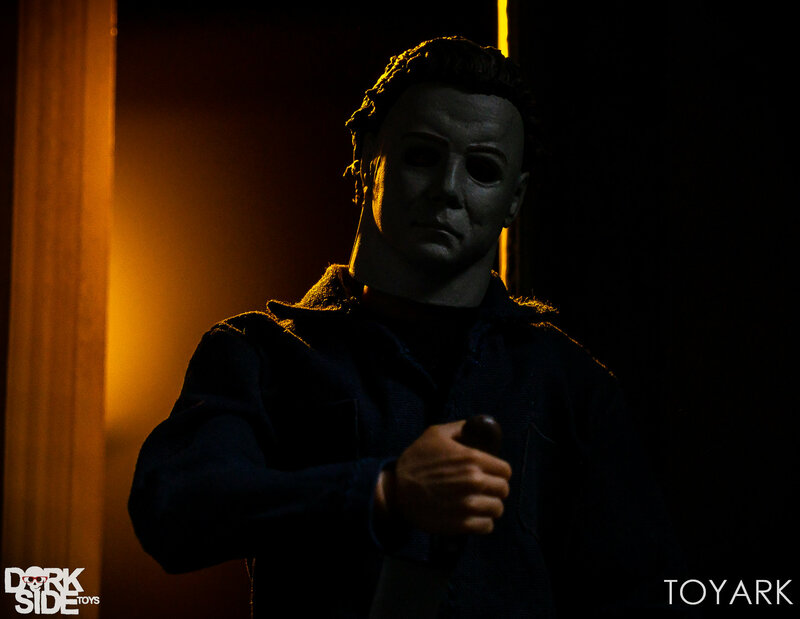 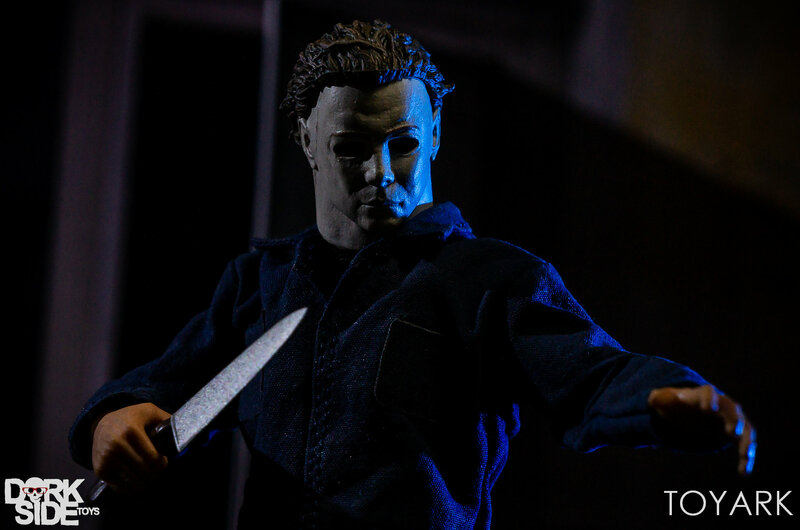 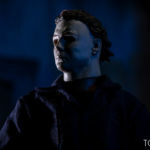 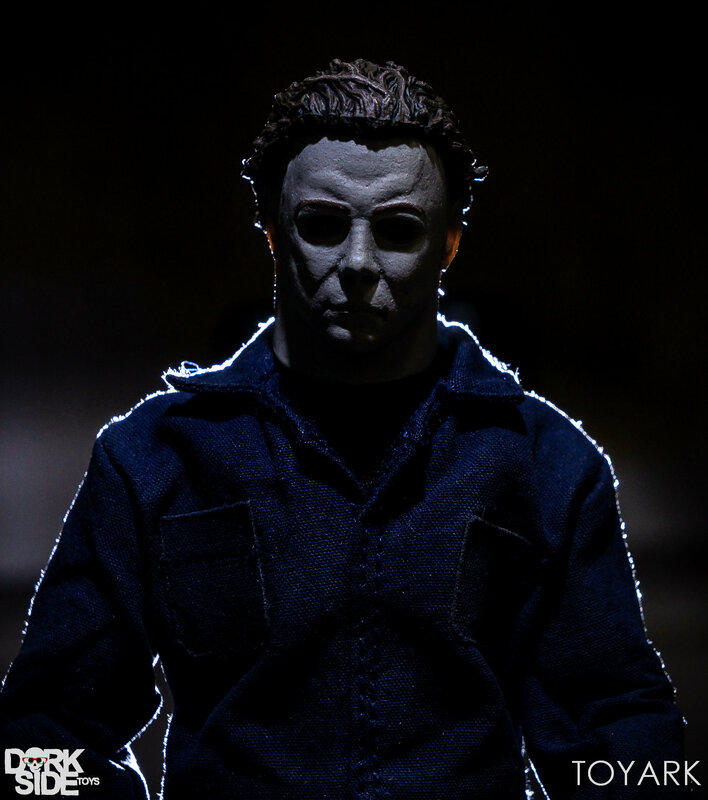 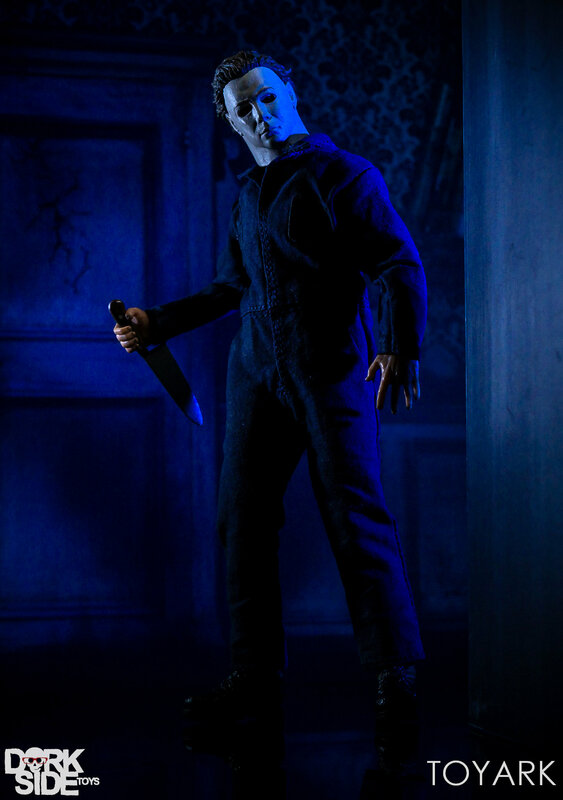 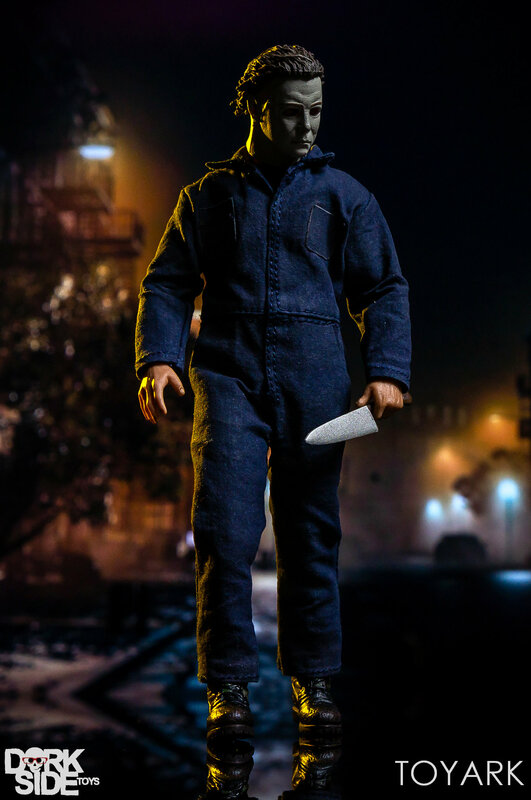 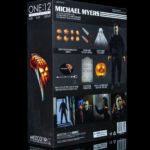 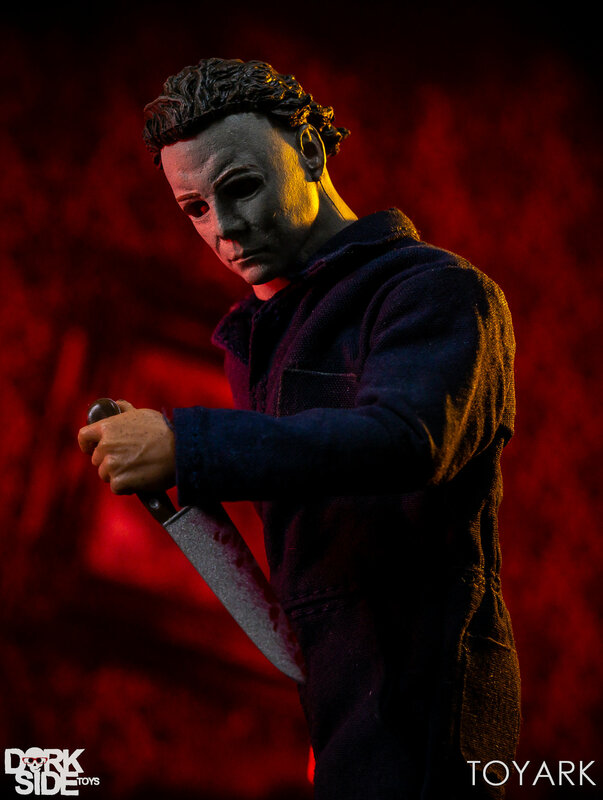 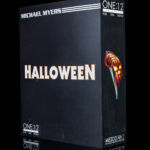 As part of the One:12 Collective, Michael Myers is meant to fit in with 1/12 scale (roughly 6″ tall) collectibles. 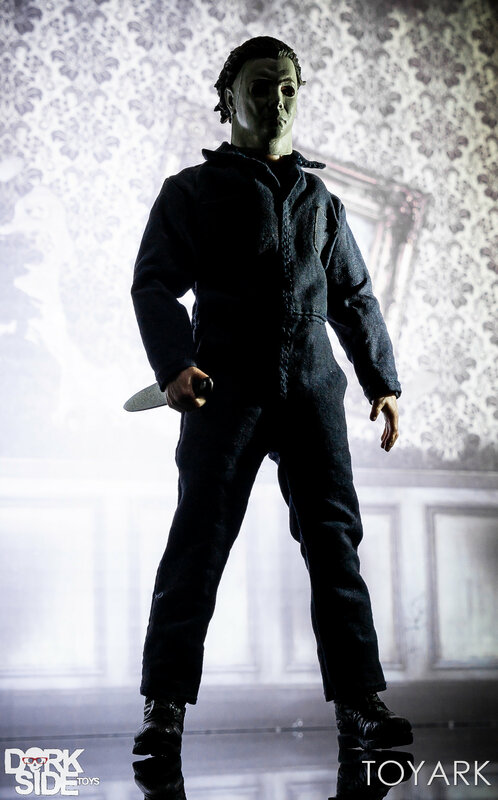 However, the figure comes in just about 6.5″ tall, though he feels a bit smaller than he should. 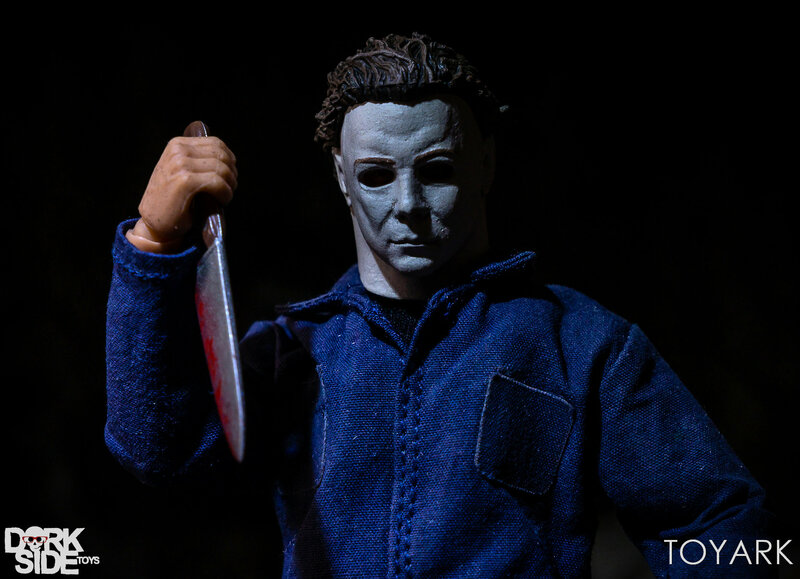 And while the smaller scale may be a problem for some collectors, the figure still packs quite a punch. 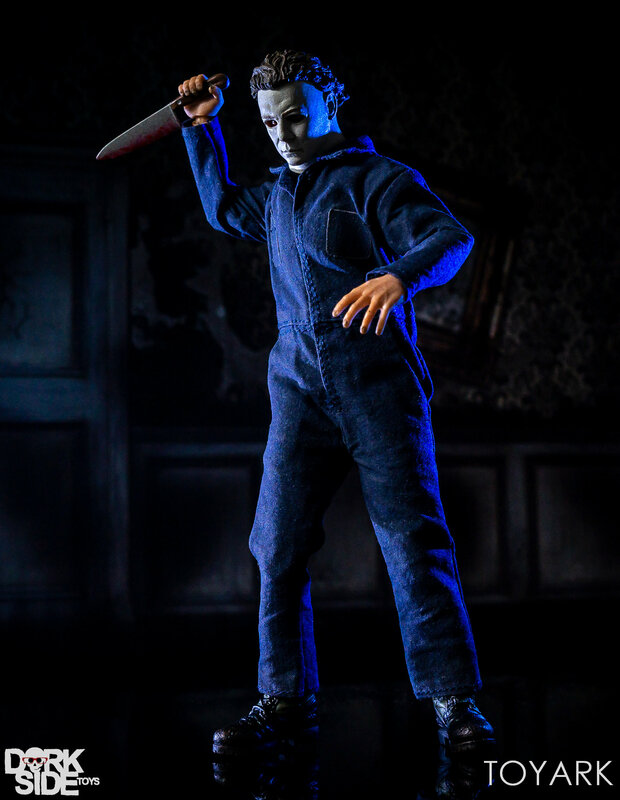 The figure has about 30 points of articulation overall, with a fabric outfit covering all of the joints. 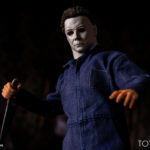 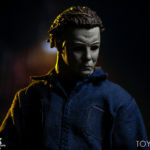 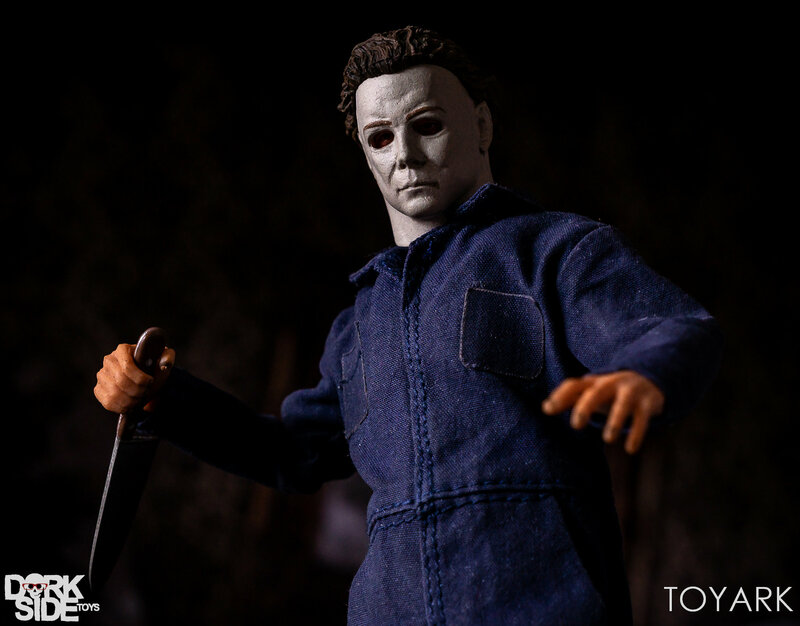 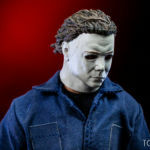 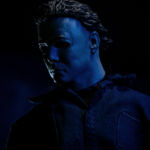 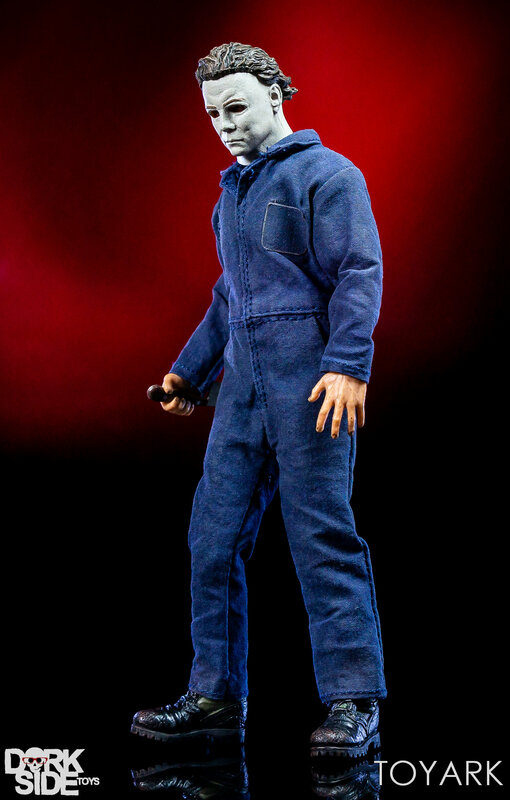 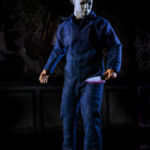 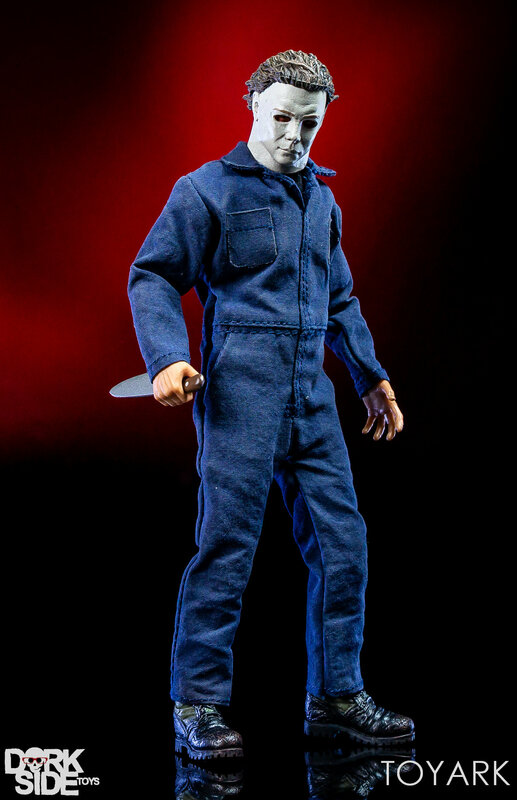 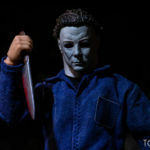 The fabric outfit is particularly notable here, as Michael Myers wears a jumpsuit. 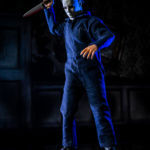 As a single piece outfit, it covers all of the figures potential joints, giving it a really natural look as you pose it. 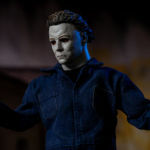 The fabric itself is very thing, so it doesn’t look bulky at all, and feels like it’s scaled about as well as it can be. Thankfully, it doesn’t hinder any of the poseability. 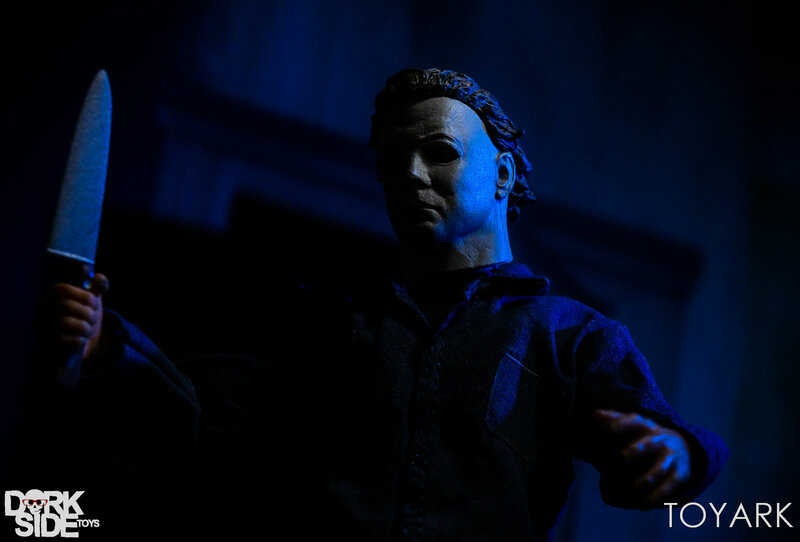 In the end, I really enjoyed posing and snapping photos of the figure. 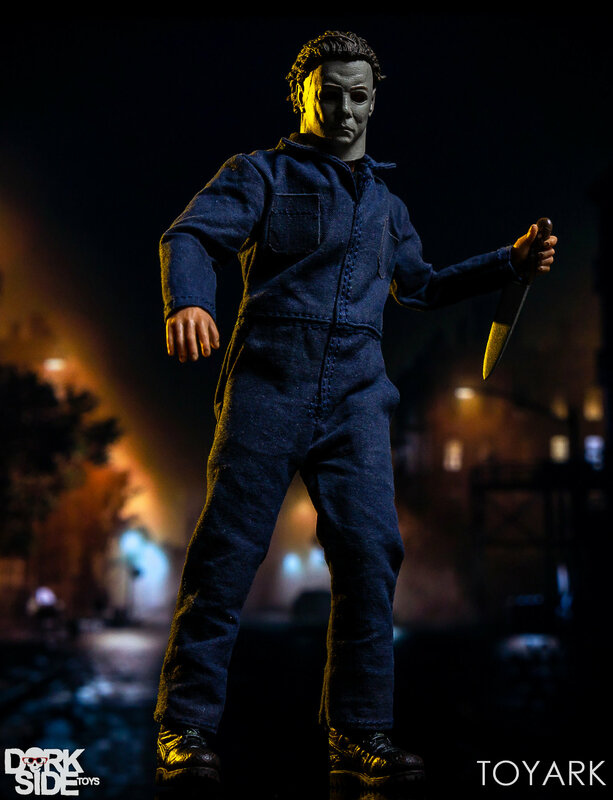 I do wish it were just a bit taller for the 6″ scale, but it looks fantastic in person. 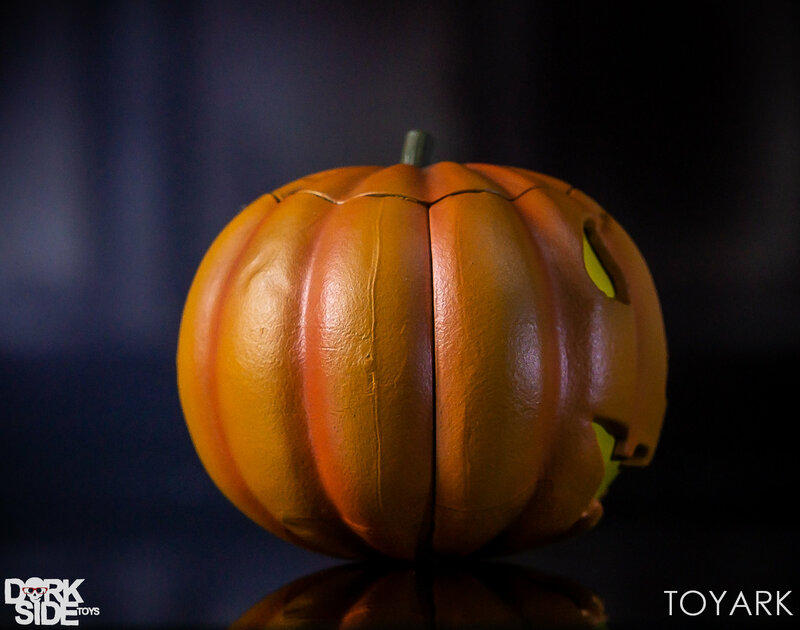 There’s a lot of display options and great attention to detail throughout. 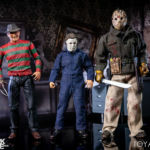 The figure will be hard to track down, as most online retailers will be sold out by now, so jeep your eyes on the secondary market and look for a price you’re comfortable with. 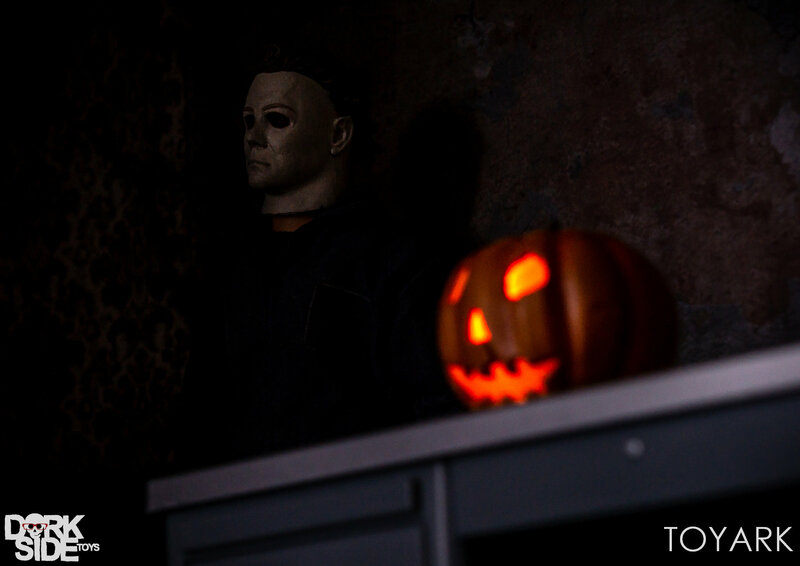 Check out some select photos below and the full gallery after that. 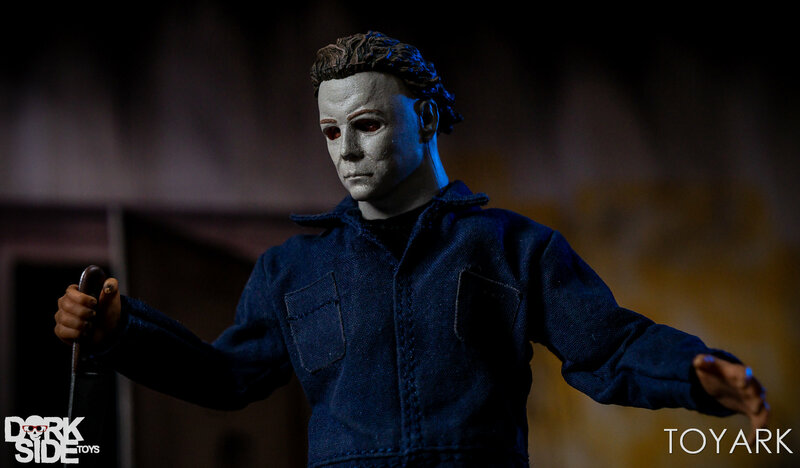 I just wanted to point out that the figure is actually roughly 6.5� in height but looks small compared to NECA. 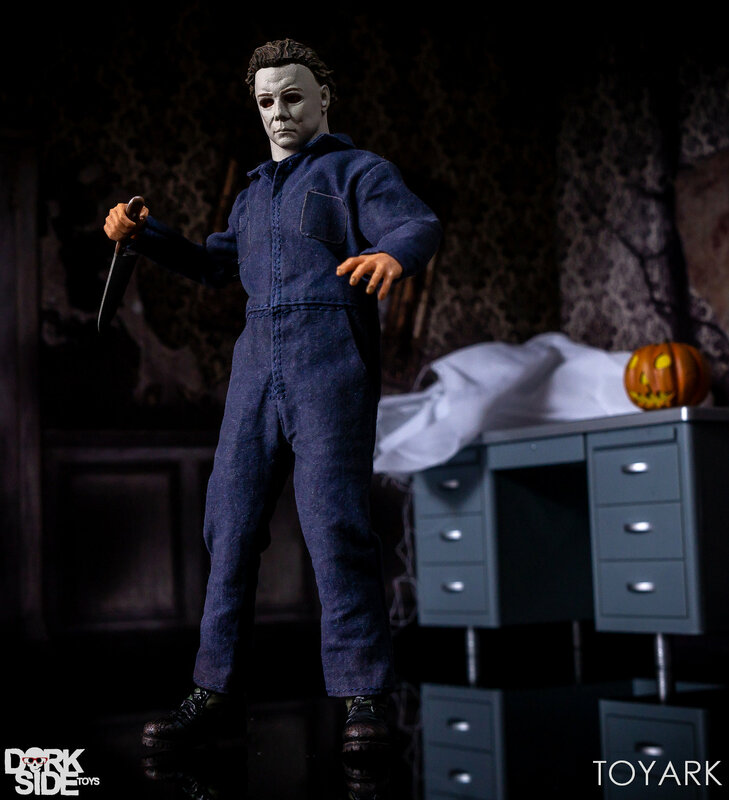 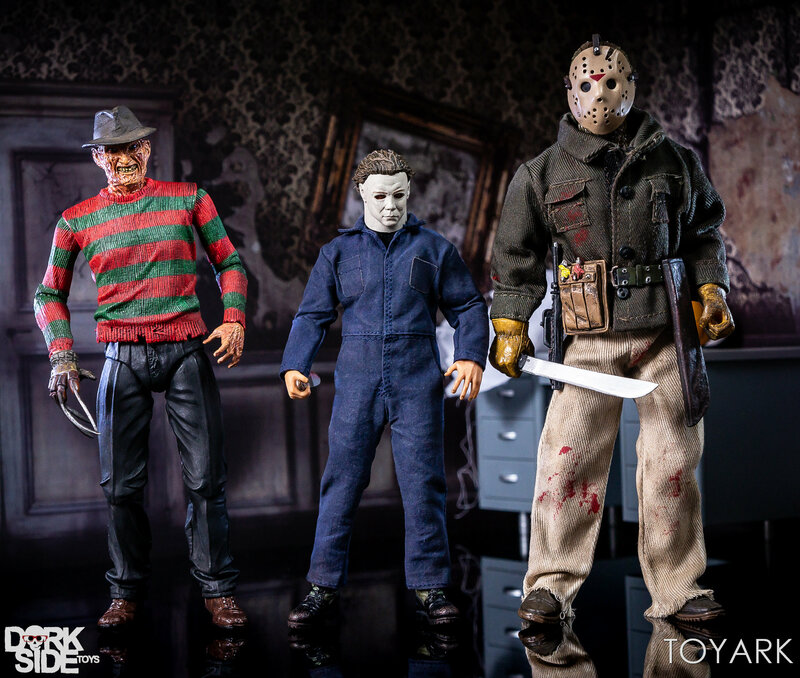 He is actually a little taller than Mezco Punisher and with the OG Myers only being 5�10� I think the height works! 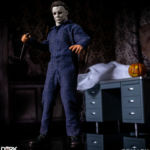 I just hate the articulation of the figure!